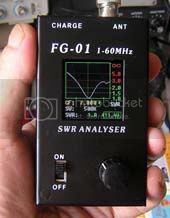 Waters & Stanton Blog » Blog Archive » First Sample Of FG-01 Arrives! This entry was posted on Thursday, August 18th, 2011 at 11:26 am and is filed under News, Products. You can follow any responses to this entry through the RSS 2.0 feed.You can skip to the end and leave a response. Pinging is currently not allowed. This looks to be a very interesting device, if it delivers all that is promised. There are many analysers on offer these days and they vary from being snake oil to the extremely expensive. What’s the likely pricing on this and is it available both as a ready built unit and as a kit? Hi Dave,the FG-01 is expected in october and will be priced £219.95 but will only be available ready made initially as there are some surface mount components. Just tried mine out. A great device for price. The curves are the best type display for me. Checked an LPH-89 LPDA and compared it to an Anritsu SC-114C, almost IDENTICAL. Looked at my longwire w/ balun, and also at a toroid I was making. What a super addition to the lab. Its compact, light, and the colour display is F.A.B. It warms up though, and the LiOn battery is a must if you need a long period on (or wear a SLAB on belt). Wish it went up to 150 MHz…..